This is so bad of me not to review one of my favorite books of this year, isn’t it? I mean, I would gladly buy a pile of this book and put it in the hands of my best friends, if I could, but write a blog post about it? Nah, too hard, let me just drop it for 2 months and see if I can still remember it. Most books, after two months, are vague souvenirs gathering cobwebs in a corner of my very busy mind, when they are not completely forgotten (that’s why I started this blog in the first place, remember?). Normally my enthusiasm withers after a while, but in that case… it’s just as fresh as the first day. I would happily start the book over again, and again, just to marvel at it and see if I can spot how de Vigan did it. The story in one sentence: Delphine is a bestselling writer who is on the verge of burnout after her last success and finds herself unable to write. She meets a new friend, L., whose friendship is intense and makes herself indispensable in Delphine’s life. Who is L.? Is this friendship helpful or toxic? Does L. even exist? I won’t develop further, but this story is also only the basis, on which so many extra levels can be built. It’s a reflexion on literature, on the creative life, on self-doubt and finding one’s voice as a woman and as a writer. It’s also a first-person narrative with a narrator who may or may not be Delphine de Vigan, who had a huge bestseller and had to answer the perilous question of “what to write next”. 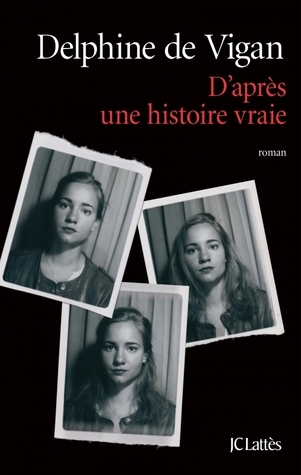 It’s also an interrogation about novels who are based on a true story, and how much truth there is in novels, or in autobiographies, or in what French authors call “autofiction”. Some reviewers have called it a “perverse thriller”, others simply a “great mindf…”. Both are true in my opinion, but you’ll want to have your own opinion. This sounds fascinating! Sometimes it’s hard to write about books we really love. Other times it seems the review practically writes itself. Yes, you nailed it: it’s easier to write about books I don’t like than those I really love. Weird, isn’t it?